9.2 Continuing Education Licensure Renewal Requirements 9.2.1.1.1 During each biennium, each Registered Nurse must earn 30 contact hours and each Licensed Practical Nurse must earn 24 hours, to be credited to that biennium. At least 3 of these contact hours must be in the area of substance abuse. 9.3.6.1 An educational activity designed for completion by learners, independently, at the learner’s own pace and at a time of the learner’s choice. 9.3.6.1.1 Examples: Articles in journals designated as continuing education articles, computer-based programs, on-line continuing education courses for which there is a test of knowledge and a certificate awarded upon completion. 9.4.2.1 The approved providers shall produce evidence of their capability to adhere to criteria indicative of quality continuing education for nurses. Each provider approved under 9.1, will be assigned a provider number by the Board and shall provide an annual statement of compliance with these criteria. 6.0 Continuing Professional Education (CPE) and Renewal 6.3 Continuing Education. All persons licensed to practice dentistry in the State of Delaware shall be required to acquire fifty (50) hours of continuing professional education (CPE) credit every two (2) years. Two (2) of the 50 credit hours shall be obtained in courses covering infection control. In addition to the CPE, licensees must provide evidence that they have successfully completed a current course in cardiopulmonary resuscitation (CPR) every two (2) years. The CPR course must encompass hands on clinical participation. On-line courses will not be accepted to satisfy the CPR requirement. Examples of acceptable courses include, but are not limited to, courses offered by the American Red Cross and the American Heart Association and courses offered or approved by any of the organizations listed in 6.5.1.1 through 6.5.1.4 of these regulations. 1.4 Continuing Education Requirements 1.4.1.1 At least 2 hours of continuing education per biennial licensure period must be in the area of medication safety/errors. 1.5.2.1 Any provider approved by ACPE. 1.5.5.4 A maximum of 2 credit hours will be awarded for First Aid, attendance at a Board of Pharmacy meeting and CPR/BCLS courses one time only per registration period. 14.0 Administration of Injectable Medications, Biologicals and Adult Immunizations 14.1.1 In order to administer injectable medications, biologicals, and adult immunizations a licensed pharmacist, a registered intern or a pharmacy student shall complete a Board approved academic and hands-on practical curriculum and maintain a current Cardio-Pulmonary Resuscitation (CPR) certificate acceptable to the Board of Pharmacy. CPR certification cannot be obtained through an on-line course. TITLE 16 Health and Safety Paramedic and Other Emergency Medical Service Systems CHAPTER 97. EMERGENCY MEDICAL SERVICES SYSTEMS § 9705 Office of Emergency Medical Services — Functions. (8) Any other organization not listed above that provides certified emergency medical training, including CPR. 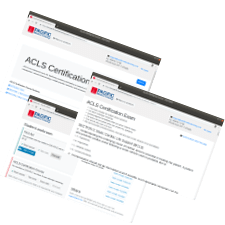 If you prefer sit-down, in-person training for ACLS, we have you covered. Total number of locations: 4. These locations CAN provide American Heart Association-branded provider cards if needed. To schedule a session, please see our in-person scheduling page. Here's a few stories that warmed our heart. Just sharing and thanking you for choosing a career that helps people that need it most.